Join Martin’s in the Celebration by Raising Your Oven Mitt to Commit! Family meals eaten at home have been proven to benefit the health and well-being of children. We’re celebrating National Family Meals Month in September, a nationwide event designed to underscore the benefits of family meals and the role we can play in helping your family share one more meal at home per week. You can find easy, healthy mealtime solutions in nearly every aisle of our stores. We offer an ever-expanding assortment of products that take the stress out of planning and preparing family meals. We invest in our associates so they can help you find the mealtime solutions that work best for you and your family. 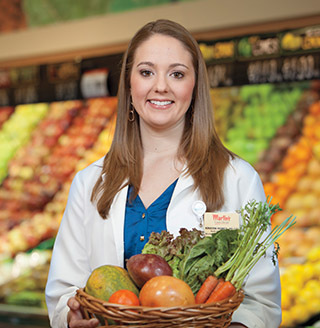 Reach out to me, your Health and Wellness Advisor, for a personal or family wellness consultation at your local Martin’s. Numerous studies have shown that home-cooked meals nourish the spirit, brain and health of all family members. Regular family meals are linked to the kinds of outcomes we can hope for all children: higher grades and self-esteem, healthier eating habits, and less risky behavior. September is a great time to commit to sharing at least one more family meal at home each week as kids are going back to school and routines fall back into place. Show us your commitment to the National Family Meals Movement on social media. Follow Martin’s Super Markets and me, Kristin Martin’s Dietitian, on Facebook for family-focused meals, shopping tips and recipes all month long! Make the pledge to commit to one more family meal at home per week by raising your mitt to commit! Have fun with the pledge and help us bring national awareness by tagging your social media photos with the following hashtags: #martinssupermarkets #familymealsmonth #raiseyourmitt.